Yep, I'm still diving into the October Afternoon 9 to 5 collection of goodies scattered about my work table. I haven't even made a dent in this fun stash so I'm just leaving it out for a little while longer. Let's talk notebooks. I love them. I love creating them. I recently found these fun notebooks at Target that have a pocket on the inside of the front cover. I removed the insert and created my own fun notebooks. All the same size so they look coordinated and nice & tidy on my desk. I created three different notebooks, hoping that I'll be able to keep all my little notes, sketches and ideas more organized. Almost all of the supplies used are from October Afternoon, with the exception of some Washi tape, a few tags and a sticker alphabet. With all the notebooks, the embellished page is tucked into the pocket with only the dimensional badge stuck to the front of the notebook. 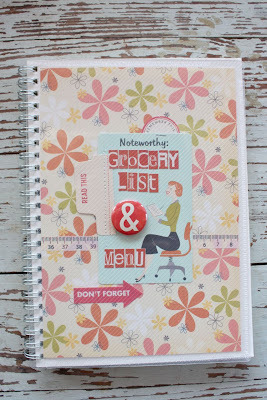 First up is my Grocery List & Menu notebook. Our busy Summer has allowed a lot of sit down meals but I do like to menu plan then shop for the ingredients. 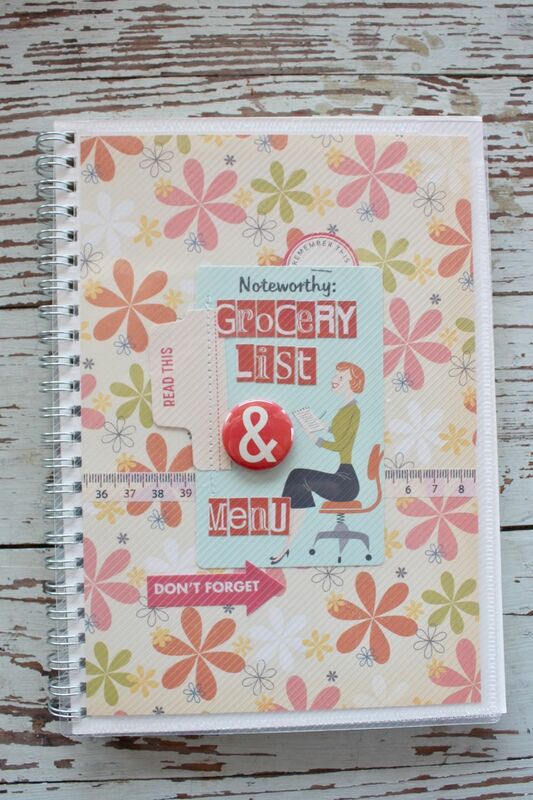 When the notebook is opened the weekly menu will be on the left side and the grocery list will be on the right side. The 9 to 5 collection has the perfect office themed embellishments for notebooks. I love this journaling card that has the note taking gal sitting in the office chair. I also used tabs and little circles that were stitched and stapled here and there. 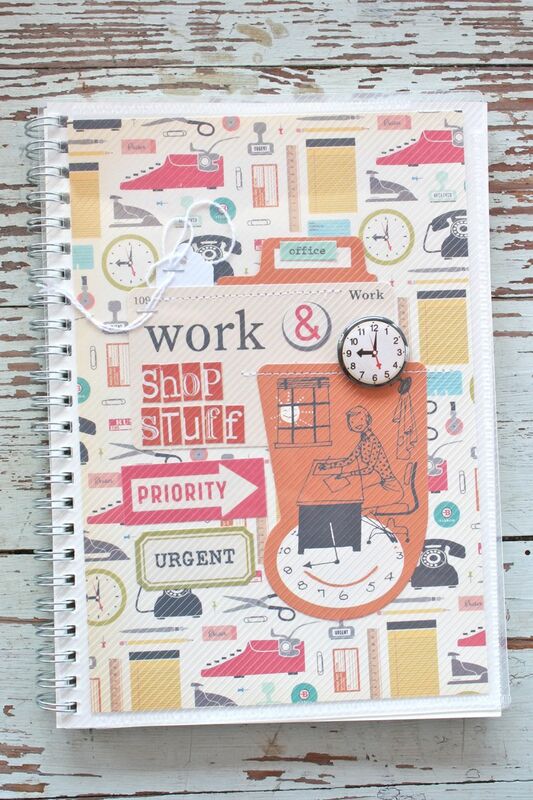 Next up is a notebook for Work & Shop Stuff. I'll most likely keep notebook at my computer desk to keep track of new shop items I want to order and new kit ideas. I'm a big fan of sticky notes so those might get taped or stapled into this notebook too. 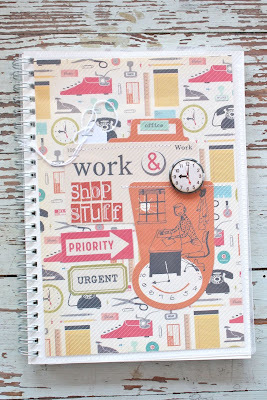 The orange paper embellishment with the gal sitting at her desk was perfect for this notebook. 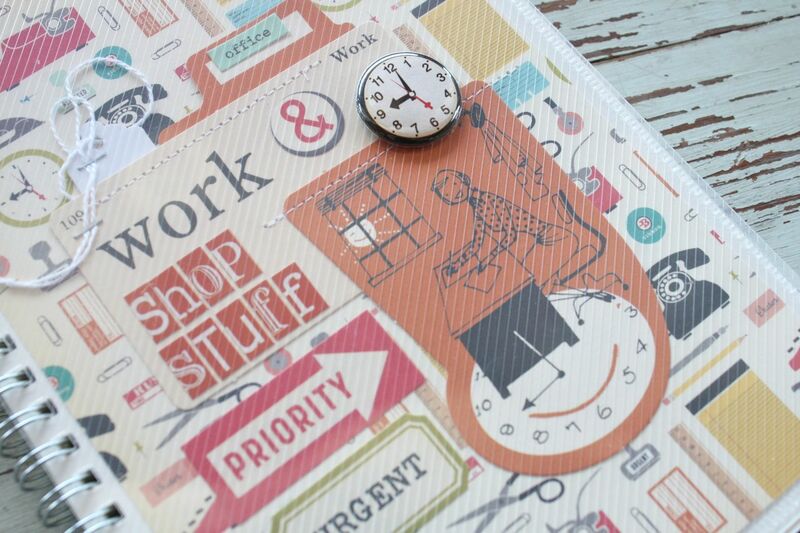 I also used a fun "work" flash card, some office themed stickers and the fun clock badge on the front of the notebook. You'll notice that the photos seem a little opaque looking.....the notebooks have some texture to the clear plastic so it looks a little obscure in the photos. 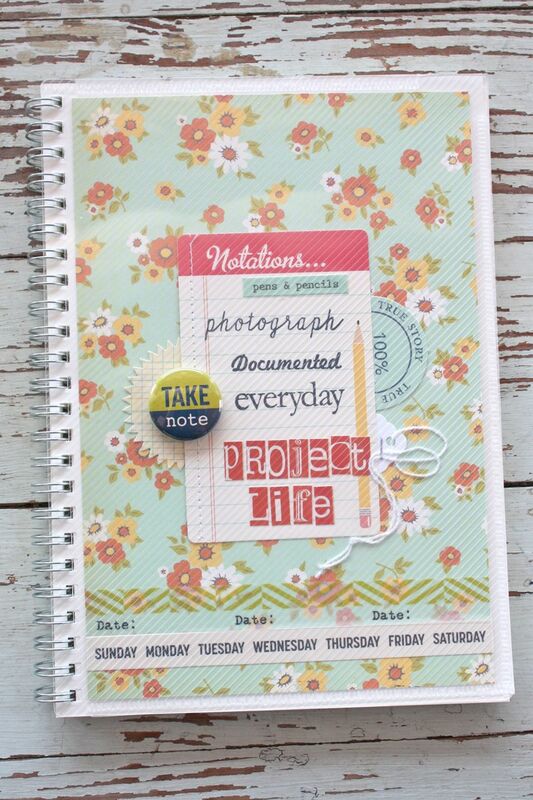 My last notebook will be dedicated to Project Life. I've been keeping my sketches on loose pieces of grid paper and they're just scattered here and there and everywhere. I like to keep the sketches once a layout is done because I usually have insert pages still to add in and the notes are all on my sketches still. My Project Life notebook will help keep it all organized. I used a journaling card that has a pencil on it, perfect for a sketch type notebook. I added in some stamped words from Studio Calico and Ali Edwards' stamp sets. I also tucked in a small tag from my shop and stapled it. The take note badges finishes off the front of the notebook. Your notebooks are so inspiring! I better get to work on creating some for myself! Thank you so much. adore the notebook idea and I would really like to try this too. Great job, love them. 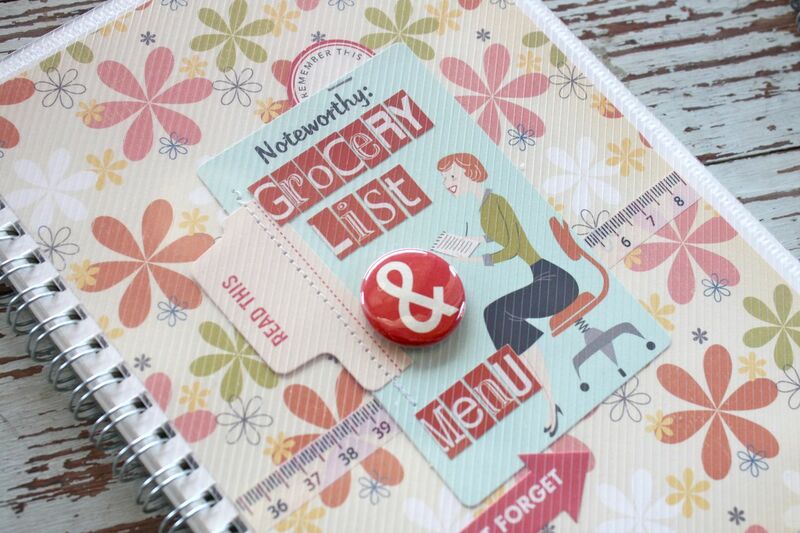 I absolutely love a good notebook& especially love when I get new supplies with them! 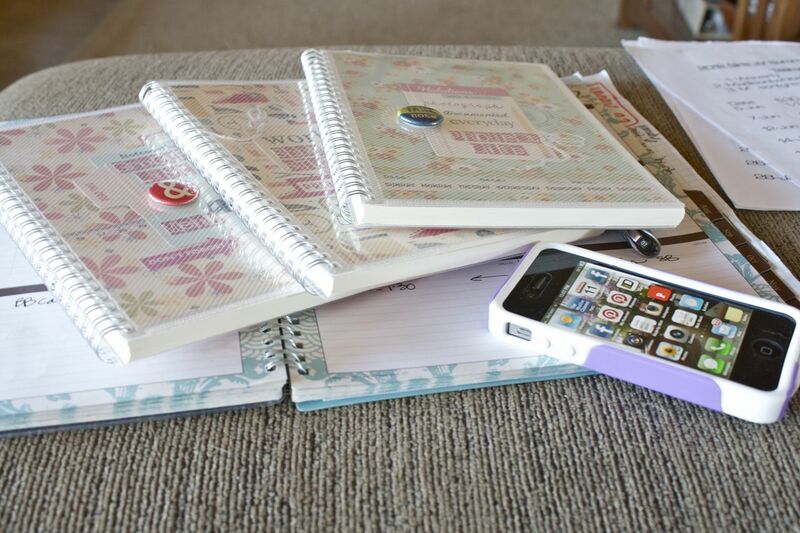 Currently housing a notebook for sewing ideas, homeschool curriculum, and my general planner. love love love these ones you made, what a great find! These are so rockin' Michelle!! I could look at these beauties all day long too:) They are G-O-R-G-E-O-U-S!! These are so awesome! I love it when you make notebooks! 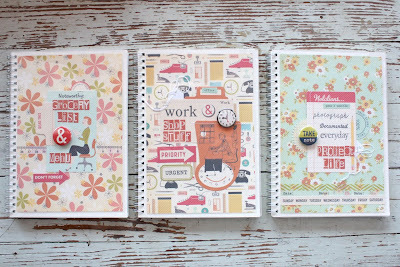 I am going to Target this week to look for these type of notebooks and I am going to get to work to make a few. Dont you just love OA products, they are one of my favorites. 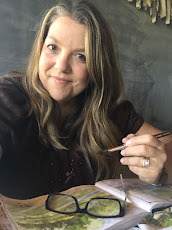 I love making lists and I have a notebooks in most rooms of my house as well as two or three at work, one in my car and one in my purse. I do better if I can write things down, once it is written down it becomes intention. 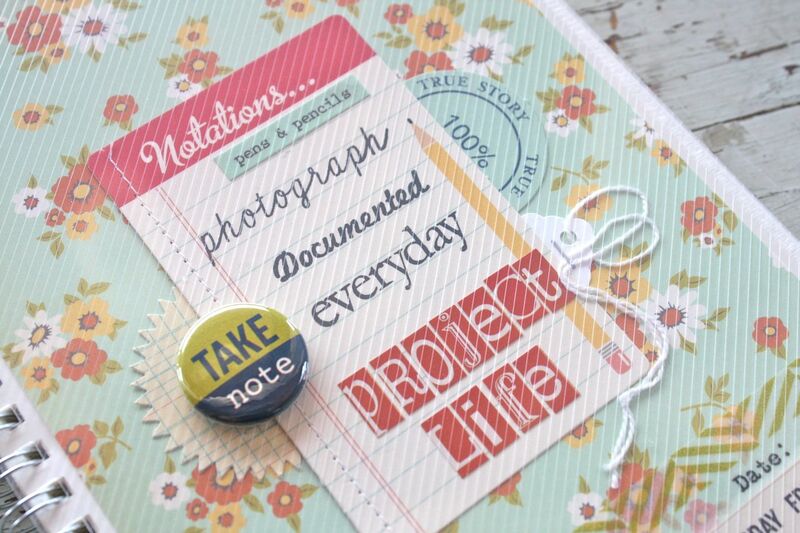 That and I just love paper and pen products:) Thank you for sharing these on your blog. 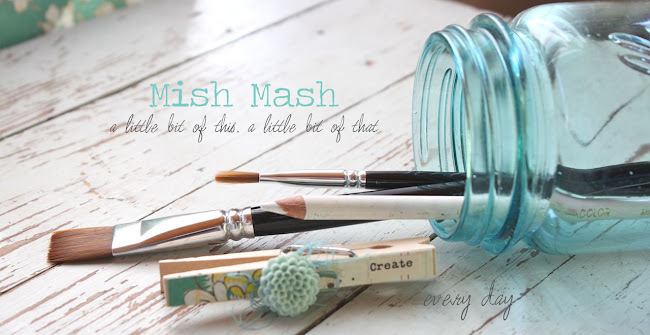 I am planning to make at least two right now, one for decorating idea's and one for grocery. Congratulations on the softball championship for your daughters, just now read it on Twitter. Life is good. I love these! I love 9 to 5 -- I think I may have to start hoarding it so I never run out! I confess though that these notebooks make me miss my daughter - she is an extremely cool young woman whom I adore and she's SO incredibly organized! she'd love these!